At benedicto, we make our own ride food as much as possible, but sometimes we run out of time or get lazy. Also, since this site is dedicated to ideas, we want to share with you what we have found in our travels. So…here are a few new and noteworthy releases that we discovered recently. We chose these product because they stick to what we believe is most effective for long days of exertion. We focused on products that use natural ingredients and are calorie dense and are easy to east and digest on the bike. We have talked about Bogg's Trail Butter before, but we wanted to share with you their new packaging and the fact that they're now offering single serve 1.15 oz. pouches. The great thing about these pouches is that they pack 190 calories in a very small and convenient format. As we said before, we love the flavors (honestly they're delicious) and you can eat it straight up or add it to oatmeal or a banana, or anything really. My favorite flavor is probably the “Expedition Espresso” and I love the light caffeine boost - it's only 20mg or 1/5 a 8 oz. cup of coffee. We also like that they're based in Portland. Give them a try. Recommended. We have to bring CLIF into this conversation, since they're releasing these Organic Energy Food pouches. Clif calls this their “Athlete Series” Real food is the big story for athletes these days. They aren't as high in calories for the size of the pouches, but if you crave real food on the trail and aren't as worried about pack-ability, these could be a great option for you. The banana Mango coconut is tasty and could be a desert option if you crave sweets. It packs 100 calories for the 3.17 oz. pouch. The Banana Beet Ginger is slightly less sweet and comes in at 110 calories for the 3.17 oz. pouch. The Sweet Potato Sea Salt is a larger 4.23 oz. pouch. Clif has blended Sweet Potato puree, Carrot Puree, Sunflower Seed butter, Apple Juice Concentrate, Quinoa, and Sea Salt. I tried the Pizza flavor and I found it inedible, but I have heard one person like it. It tasted too much like salty tomato paste and was not appetizing. Also, if you have time and are a DIY person this could inspire you to make your own pouches. I have put baked sweet potato in a ziploc and cut the corner, or you could source a reusable squeeze tube and make your own real food pouches. My only other critique is that the caps seems larger than they need to be, but probably work well with cold hands and they give you something to hold onto when fishing for one in your jersey pocket or pack. GU is a company that is perhaps known best for it's energy gels and chews, so it's cool to see them branching out into the world of solids or what we call “real food.” Magdalena Boulet is an Olympic marathoner, ultra runner, and also happens to be GU's vice president of R&D and Innovation. We feel that Energy Sticks are notable for their use of quinoa and other natural ingredients. Maybe quinoa is trendy, but it's a complex carbohydrate and good source of amino acids. I'm always a sucker for bars with organic dates and I can imagine a date-quinoa pairing would be potent. Worth noting is the long and narrow format. I could see that fitting better in a jersey pocket and being easier to eat a bite at a time. Energy Sticks won't be available until late 2016. When they hit, they'll retail for a dozen for $30 or $2.50 each. I was happy to find a small company called Sweetwood Cattle Co. at Interbike. Sweetwood is a family owned operation from Steamboat Springs, CO that sells naturally-raised meat. They sell steaks and meat snacks, period. Their 2 oz. bags of jerky sell for $8 each or you can get a jerky sampler of 6 flavors for $30. 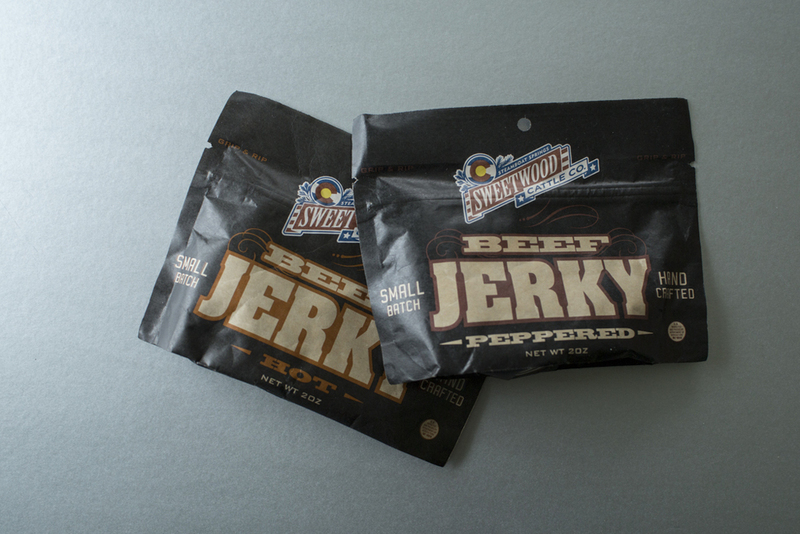 I know you can get gigantic bags of Oberto or similar at Costco, but Sweetwood jerky is particularly moist and the flavors are great. I think jerky is a great way to get protein on longer bike trips, so a jerky sampler might be just the thing. Also, it's important to have a variety of flavors to keep your brain happy, so the sampler might just be the thing. I can make jerky at home in my dehydrator, but I have a hard time doing multiple flavors and getting it moist. In some cases, I say let the pros do the work.